Last November my 5-year-old daughter Frances “Frankie” and I set off for our once-a-year weekend together, bound for Northern Minnesota and a cabin on the shore of Lake Superior. Travel “up North” is something most of us in Minnesota look forward to and welcome as often as we can accommodate. It’s a destination that signifies something that is hard to put in words. It seems it’s what it lacks that pulls you in, more so than what it offers. Regardless of ones motive, the possibilities are endless amid the wilderness and waters of our some 10,000 plus lakes. While we departed with cloudy skies and windshield wipers humming, rain or shine we were once again excited to be leaving town together. Along our route the weather turned increasingly cold, with clouds growing thicker and winds gaining strength. I knew long before we arrived that my idea of hiking through the woods along the waters edge, was not what Frankie would consider fun amid weather like this. Lake Superior, the largest of the Great Lakes, signifies in many ways the gateway to the north woods. The vastness and the unpredictable nature of the water is something that keeps it engaging in terms of trying to figure it out, trying to take it all in. Upon arrival to the cabin approximately 5 hours north of Minneapolis the temperature was just barely above freezing. The winds were blazing across the water with surf hitting the shore in a way that many at the resort, including myself, had not often experienced but were excited to be witness to. I awoke several times during our first night, sleeping some 50 feet from the surging waves that pounded the shore and windows of our seemingly snug, yet audibly uninsulated cabin. Throughout the night the storm continued to grow, ratcheting up its intensity by the hour. In the morning after stoking the fire and a slow breakfast Frankie and I set out to explore. Just steps from our door Frankie was quick to advise she’d had enough. I brought her in and contemplated heading back out, camera in hand for whatever I might be able to capture. I was now pleased I had packed at least a few essential pieces of equipment. I figured I’d last about 10 minutes, but was certain I would come away with visuals unlike any I’ve captured of the lake in the past. The North 47° motion edit, named by the geographic coordinates of the storm, was captured that morning in no more than an hour of shooting. Time in the elements was punctuated by many breaks to the cabin with Frankie tearing off paper towels to help dry both camera, lenses, and my face. With feet firmly rooted and backside to the wind I was able to grab no more than 2-3 second video clips, not sure what if anything would ever become of the footage. It was one of the most extreme conditions I’ve ever shot in. Upon retiring to the cabin I found the view from our upstairs bedroom window almost as interesting as the waters edge. Racking or shifting focus from blowing trees and surging waves to water droplets running down the window offered a quieter element to what I had just been struggling to capture outside. Needless to say it was an exciting edit to see come to life. All video clips that I captured were shot in slow motion at 60 frames per second (60 fps), a look that many in the realm of video are currently drawn to as camera technology continues to evolve. NathanielSchmidt, one of our most recent partners in the world of video put the footage together against an audio track that quiets and compliments the wind, waves, and turbulent nature of the footage. Upon completion we taped the talents of Coelement for graphic animation. A new year brings new opportunities and of course new work. 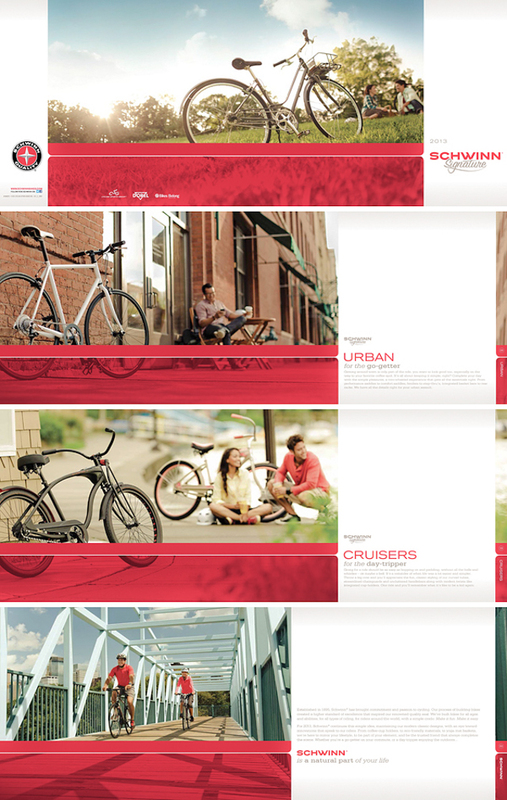 The debut of the 2013 Schwinn Catalog is out in select worldwide bicycle retailers showcasing their new line up of bikes ranging from Urban style to Cruisers, and Sport Hybrid to Mountain bikes and more. It's a pretty sweet collection of bikes. Design certainly hasn't been overlooked as the brand continues to evolve. The matte black "Cruiser" model above even comes with a built in bottle opener. Over two days of shooting for Schwinn we set up in multiple locations around the Minneapolis area, each lending to the perfect backdrop for each particular style of bike. The results are evident in the new catalog as the bikes stand out with the complimentary environments adding to the strength of the imagery. We are quite pleased with how everything turned out. It's refreshing to look back amid the cold of winter, at a mid-summer production, recalling sunny skies, green grass, as well as all the bikes and locations we paired up for this project. Happy New Year to all those we worked with last year. We are looking forward to continued adventure and all that 2013 has in store!